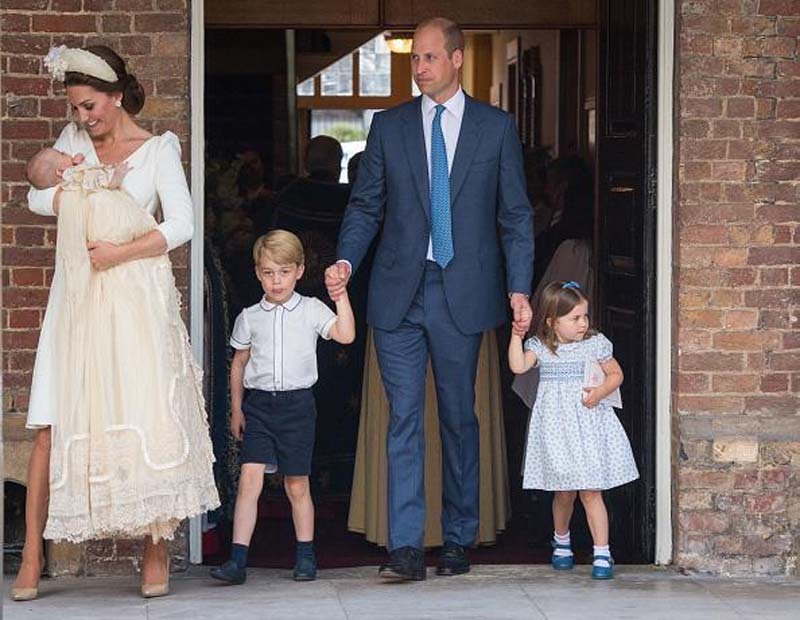 Princess Charlotte hilariously mocked the photographers waiting outside the Chapel Royal on Monday for Prince Louis’ christening. The three-year-old royal reportedly told them that they are not coming to her younger brother’s baptism. [post_ads]Princess Charlotte was also photographed shaking hands with the Archbishop of Canterbury Justin Welby, who led the service. Prince William also encouraged Princess Charlotte to shake hands with the dean of the Chapel Royal, as well as the Right Reverend and Right Honorable the Lord Chartres. After Princess Charlotte shook hands with the heads of the church, Prince William was seen mouthing the words, “Well done,” to his daughter. All this happened while Prince George clung on to his dad’s other hand. It is unclear if he also greeted the heads of the institution. In related news, Princess Charlotte once again stole the show one day after Prince Louis’ christening. On Tuesday, Princess Charlotte and Prince George were seen watching the 100th birthday celebrations of the Royal Air Force with a special flypast from the Buckingham Palace window. Their parents and the other members of the royal family attended the event from the palace balcony. However, the two youngsters were not asked to join them outdoors. Princess Charlotte again captured everyone’s attention when she suddenly stuck her tongue out. Almost two months ago, Princess Charlotte did the same gesture while in the car on her way to Prince Harry and Meghan Markle’s royal wedding at St. George’s Chapel in Windsor Castle. Princess Charlotte has also mastered the royal wave, which she did at her uncle’s wedding and at the Trooping the Colour. The young girl waved to the massive crowd and didn’t shy away upon seeing them. However, she also made headlines at the Trooping the Colour for an entirely different reason. Princess Charlotte fell from her stool while watching the color display and was comforted by her mom. Minutes later, she acted as though nothing happened and continued watching the show. At that time, her older brother, Prince George, was standing beside her. Princess Charlotte is the second child of Prince William and Middleton. She was born on May 2, 2015.